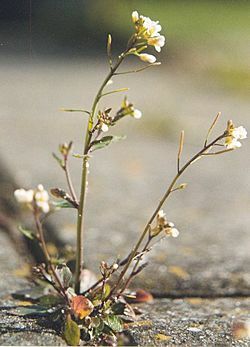 Arabidopsis thaliana is a small flowering plant native to Europe, Asia, and northwestern Africa. It is widely used as a model organism in plant genetics. Arabidopsis is a member of the mustard (Brassicaceae) family, which includes cultivated species such as cabbage and radish. It was the first plant genome to be sequenced, completed in 2000 by the Arabidopsis Genome Initiative. The most up-to-date version of the Arabidopsis thaliana genome is maintained by The Arabidopsis Information Resource (TAIR). Much work has been done to find out what its 27,000 genes and 35,000 proteins do. 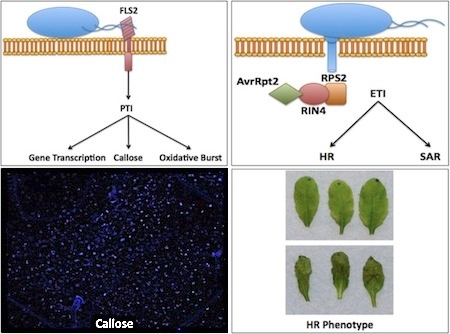 Arabidopsis is a popular tool for understanding the molecular biology of many plant traits, including flower development and light sensing. Arabidopsis thaliana Facts for Kids. Kiddle Encyclopedia.